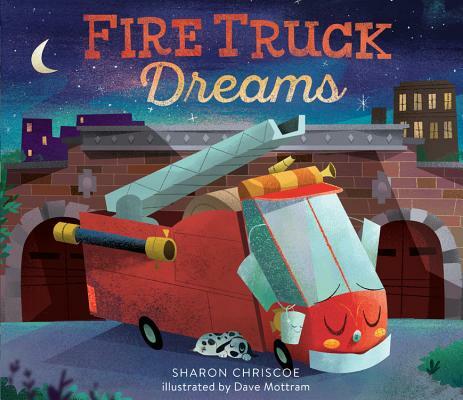 For fans of Goodnight, Goodnight, Construction Site comes an exciting new bedtime story about a brave little fire truck. A fire truck has had a big day of putting out fires and saving kittens, and now it's time to sleep. After making sure all is quiet and safe, he rolls back into the station for a shower, swishes and swigs a bedtime refreshment, and settles in with a bedtime story. But a hero's job is never done, and the fire truck dreams of taming a ferocious campfire and celebrating the end of his exciting day with s'mores! This delightful book about a heroic fire truck preparing for bed will be a favorite for any fan of fire trucks and everyday heroes. As always, Sharon Chriscoe lulls the reader with her witty and gentle rhyming verse, accompanied by Dave Mottram's charming illustrations. Fire Truck Dreams is certain to bring joy to any bedtime routine. Sharon Chriscoe loved being a girl scout-and even though a fire truck never visited her campsite, she did enjoy her share of delicious s'mores. She is the author of Race Car Dreams, illustrated by Dave Mottram, Bulldozer Dreams, illustrated by John Joven, and The Sparrow and the Trees, illustrated by Susan Detwiler. Sharon and her family live in Pilot Mountain, NC. Dave Mottram always wanted to be an illustrator. He drew pictures until there was no paper left, then he drew on grocery bags. Nowadays he draws on his daughter's lunch bags and illustrates children's books in Ohio where he lives with his family.